Two more civilians were killed today in a landmine explosion in Benghazi’s Gwarsha distirct. Abdul Salam Ali Al-Shafi and his son Walid died when they accidentally detonated a mine left by militants at their farm in the area. Despite warnings by the Libyan National Army about the area being littered with mines and that people should stay away until it had been cleared, they had returned to the family home to organise affairs there. 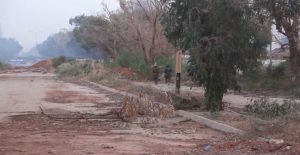 According to Saiqa special forces spokesman Colonel Miloud Zwai, the number of people, both civilian and military, killed in mine explosions in Gwarsha’s Shara Shajar (“Tree Street“) alone since the district was liberated on 17 February last year is 24. The figure did not take into account the number of those maimed or otherwise injured as a result of landmine explosions in the tree-lined street at the entrance to Gwarsha after Garyounis, said Zwai. Yesterday, mine sapper Mohammed al-Barasi died there when a device he was attempting to defuse blew up. Speaking about the victims, Zwai was particularly angry at what he said was the constant concern about human rights abuses by an international community that was otherwise silent over the daily crimes committed by terrorists against civilians and soldiers alike in Benghazi.